Charles E. Merrill Publishing Co.
1/4 x 4 x 4 in. 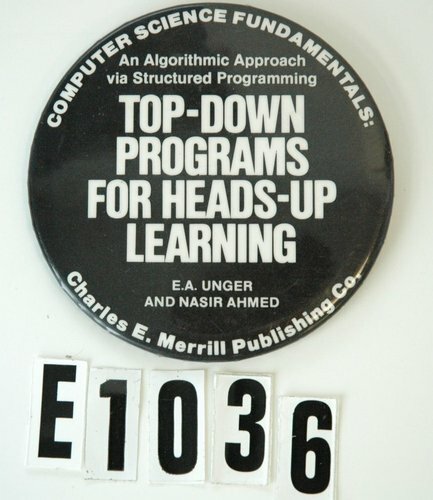 "COMPUTER SCIENCE FUNDAMENTALS: An Algorithmic Approach via Structured Programming" and "TOP-DOWN PROGRAMS FOR HEADS-UP LEARNING" and "E.A. UNGER AND MASIR AHMED" and "Charles E. Merrill Publishing Co." printed on button.